[starttext]1. Angioblastic cords: Mesenchymal cells in the cardiogenic area form 2 angioblastic cords. 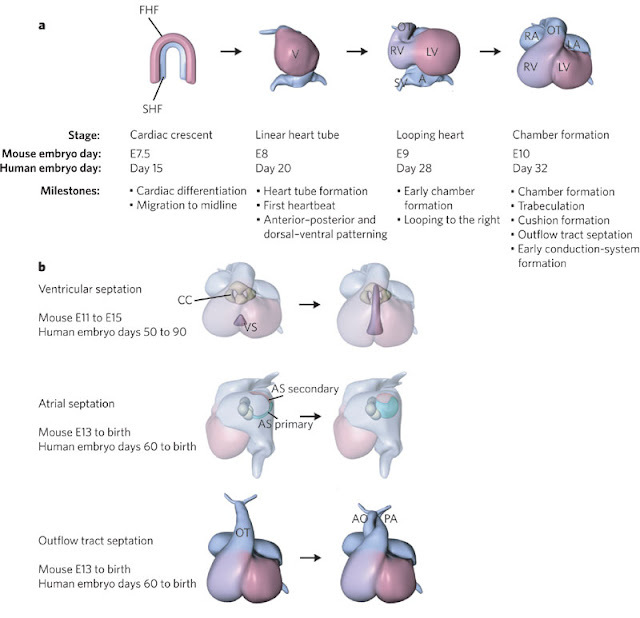 These c.ords become canalized to form 2, endothelial heart tubes. 2. Heart Tube: Tubes fuse to form a single endothelial heart tube. The surrounding mesoderm form the primitive myocardium. 3. The heart is composed of an endothelial tube separated from the primitive myocardium, by gelatinous connective tissue called cardiac jelly. Endocardial cushions form on the dorsal and ventral walls of the atrioventricular canal. The atrioventricular endocardial cushions fuse, dividing the atrioventricular canal into right and left atrioventricular canals. Septum primum unites with the Atrioventricular septum (endocardial cushions). Foramen primum forms and then disappear. Perforations appear in the central part of the septum primum. The perforations form foramen secundum. Septum primum fuses with the endocardial cushions, obliterating the foramen primum. Septum secundum overlaps the foramen secundum in the septum primum. Septum secundum forms foramen ovale, opening between the atria. Part of septum primum, forms valve for foramen ovale. During fetal life, blood is shunted from the right atrium to the left atrium via the foramen ovale and foramen secundum. Closure of the foramen ovale normally occurs immediately after birth and is caused by the increased atrial pressure that result from the changes in the pulmonary circulation and decreased right atrial pressure caused by the closure of the umbilical vein. The septum primum forms the floor of the fossa ovalis. The inferior edge of the septum secundum forms a rounded fold, the limbus fossae ovalis (anulus ovalis). IV septum develops in the floor of the ventricle and grows toward the Atrioventricular cushions but stops short leaving the interventricular(IV) foramen. Neural crest cells migrate into the truncal and bulbar ridges of the truncus arteriosus, which grow in a spiral fashion and fuse to form the aorticopulmonary (AP) septum. The AP septum divides truncus arteriosus into the aorta and pulmonary trunk.